In 2007 I was asked to be the regional bryophyte recorder for the BBS for VCs 66, 67 and 68. It had been some years since any of these vice-counties had a BBS recorder. I spent quite a bit of time over the next two years gathering old records that had never been sent in to BBS from various organisations in the region. Using the existing BBS database for the three vice-counties, plus these extra records, I wrote a draft paper in 2010 summarising the status of all bryophyte species in the region. This draft paper was little more than a list of species, with any national or regional conservation statuses listed. Since then I have been adding more detail, including a paragraph on each species describing it's distribution and habitats and details of the last records of rare or uncommon species. I have also added a bit more general information about bryophytes and bryophyte recording in North-east England. The latest updated version shouId be ready shortly. It includes all records up to the end of 2014. It's surprising how much time something like this takes. I didn't think in 2010 that it would take me four years to produce the expanded version of the paper! 657 bryophyte taxa have been confirmed from the region, but 42 of these have not been seen since 1960 or earlier, leaving 615 'recently recorded' species. VC66 has 493 species recorded, VC67 has 502 and VC68 has 503. The number of species in VC68 is particularly impressive considering it has had much less recording effort than the other two VCs, and it is roughly half the size of VC66 and roughly one third the size of VC67. We have 18 RDB species (three RE; two CR; four EN; none VU). We also have eight NT and three DD species. One of our species is protected by European legislation and three species are protected under British law. 13 of our species are Nationally Rare and a further 91 are Nationally Scarce. The database currently has just over 90,000 records. 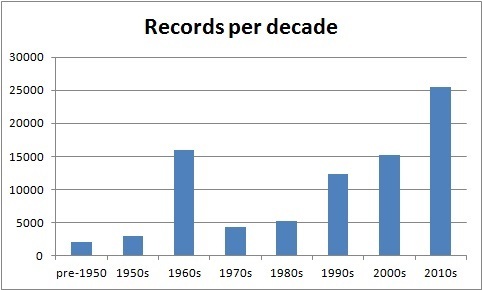 The peak in the graph to the left for the 1960s is due to all records from Graham's Flora of County Durham being attributed to 1965 in the database. In fact, these records were from all years between 1965 and 1986. So many of the 1960s records should really be included n the 1970s and 1980s bars. If this false peak is smoothed out, the overall trend in the number of records per decade can be seen to increase exponentially. The bar for the 2010s includes records for only the first half of this decade. Part of the reason for the big increase in recording effort in this decade is that computers make it much easier to store large numbers of records now. The other reason is that our most prolific recorder of all time Andy McLay, is currently actively recording. 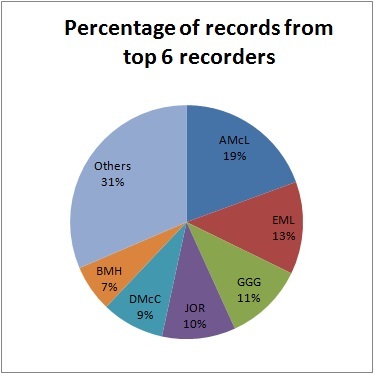 The pie chart on the right shows that our top six recorders (in terms of number of records made) have contributed 69% of all of the records in the database. Evelyn Lobley is in second place, despite not having had the advantage of computers for storing records. She was actively recording between the 1930s and 1970s. However, the 13% of the pie attributed to her greatly underestimates her overall contribution. Many of the rare species recorded in the region were recorded by her and many of these have not been recorded by anyone else since. Although she died almost 40 years ago, roughly 18% of the most recent records of species that are rare in the region are still attributed to her. Brian Humphreys, who did lots of recording in VC66 in the late 1980s and 1990s. The map on the left gives an impression of how even (or uneven) the recording had been in different hectads in the region. In general the western upland parts of the region are considerably more species-rich than the eastern lowland areas. For instance, it is not usually that difficult to find 100 or more species in a day in an upland site, but in many lowland areas you can struggle to find 30 species unless there is some woodland in the area. 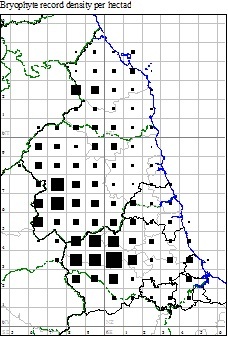 However, the differences in size between the squares in the upland areas compared to the lowland squares on the map are largely due to recording bias. Bryophyte recorders know that they will find more species in the uplands, so they tend to visit upland areas more often. Ideally our recording effort would be more evenly spread throughout the region. Even in the upland areas we have a bias in our records. The uplands of VC66 are better covered on average, VC67 is in the middle and the uplands of VC68 have had relatively little recording effort apart from The Cheviot area.